Led by Midlothian-native Tyler Wilson’s seven nearly flawless innings, the Bowie Baysox (44-37) rolled to a, 3-0, shutout win over the Richmond Flying Squirrels (46-34) in front of 9,457 at The Diamond on Saturday night. With the win – their third straight – the Baysox were able to claim the extended five-game series. The Baysox recorded three hits against lefty Kelvin Marte in the first inning, but did not score. However, they collected three more in the second inning and took a 2-0 lead. Chris Marrero led off with a double into the left-field corner. An out later, Garabez Rosa knocked him in with a single. Rosa moved up a base on a passed ball and a ground out, and scored the second run on a single from Ronald Bermudez. Marte steadied himself through the next three innings, but ran into more trouble in the sixth inning. He conceded back-to-back singles to Christian Walker and Dariel Alvarez to start the inning before walking Marrero to load the bases with nobody out. Marte struck out Michael Ohlman looking and was lifted from the ballgame in favor of lefty Josh Osich. Osich fanned both Rosa and Sharlon Schoop to end the threat. Marte (6-3) allowed just two runs on 10 hits across 5 1/3 innings, but took his third loss of the season. He walked one and struck out three. Walker knocked in the only other run of the ballgame with a soft-single off Osich in the seventh inning. Meanwhile, Wilson (10-5) was cruising. He permitted just two hits over seven scoreless innings, walked one and struck out nine. His 10th victory pulled him even for the league-lead in wins. Right-hander Juan Morillo recorded just one out in the eighth inning before he found trouble with his command and was removed. However, righty Oliver Drake came on and had no trouble recording the final five outs for his league-leading 19th save of the season. The finale of the five-game series is scheduled for 1:35 p.m. at The Diamond on Sunday afternoon. Richmond LHP Ty Blach (5-4, 2.69) will make the start against Bowie LHP Eduardo Rodriguez (3-4, 5.00). 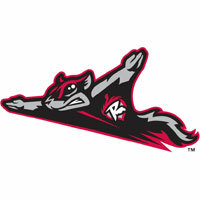 The Flying Squirrels Pregame Warmupbegins at 1:05 p.m. on Sports Radio 910 and SportsRadio910.com.